DREAMING OF A JEWISH CHRISTMAS is the Christmas special you always wanted but never realized you did. The film, up for an international Emmy on Monday, is a killer look at the classic holiday songs, most of which were written by Jewish composers. As someone said why would you write a song that only 3% of the population will sing when you could write one that 97% would. Charting the experience of the Jewish immigrants into American society the film shows us he influence that they made in popular culture. In charting the course of the various songs (many of which are performed in glorious and unexpected ways) we see how people’s ideas of Christmas changed from a purely religious holiday to something secular. We see how the collision of Irving Berlin’s White Christmas in December 1941 created the nostalgia for a past that never was (the song’s speaking of the idea of home meant so much to the soldiers fighting across the globe). 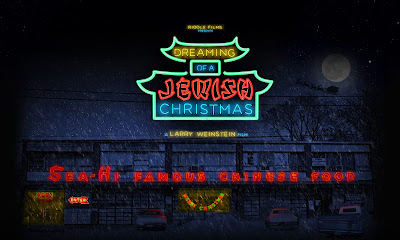 While the film is primarily about the “Jewish” Christmas the film also deals with the experiences of other minorities, particularly the Chinese. While it could be seen as stereotypical to say that Jews went to Chinese restaurants on Christmas because they were the only ones open, the fact is that Christmas was often the busiest day of the year kind of indicates there being more to the stories than we might think. I love this film. I love that despite the title this is about all of us in one way or another.